I bought this card at the Newark Liberty International Airport (EWR) on August 29, 2013 during a connection of my return flights from the Baltimore/Washington International Thurgood Marshall Airport (BWI) to Las Vegas. I was in Washington D.C. for the 50th Anniversary of March on Washington. On the back of the card, it reads "the thriving metropolis of New York City is one of the best places in the world to let loose and go wild! 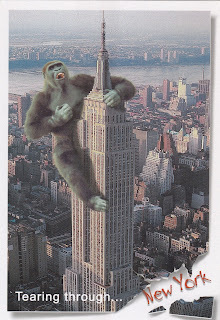 With hundreds of shops, restaurants, night-clubs, shows and sights, there is so much to see and do, it is easy to get as excited as King Kong." As the Memorial Day weekend marks the beginning of all the summer activities, if you are in New York City, you don't want to miss World Stamp Show-NY 2016, an eight-day, once-a-decade international celebration of stamp collecting in the U.S. at the Javits Center from May 28 to June 4, 2016. It coincides the 28th Fleet Week New York in which United States Navy, United States Marine Corps, and United States Coast Guard are honored for their sea services. The stamp show opened with presenting the colors by the U.S. Navy Color Guard and singing the national anthem by MFC Dan Smith of the U.S. Navy. Up to 300,000 visitors are expected to attend the show, which is free and open to the public. Elsewhere, however, a gorilla related story turned out to be a tragedy: Cincinnati Zoo killed a gorilla to save a boy. It ignited debates on animal welfare, parental responsibility and adequacy of safety measure in the zoo.